I asked our Technical Departmment how someone would go about making kitchen tap repairs to their kitchen tap to prevent the water shooting in all directions? “It could be that you have debris or lime blocking up the aerator / antisplasher on the end of the spout. 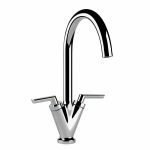 The majority of spouts have an aerator that can be removed by hand to enable you to remove the part and clean away the debris and thus repair the kitchen tap. 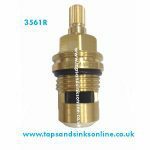 The majority of spouts have an aerator that can be removed by hand to enable you to remove the part and clean away the debris and thus repair the kitchen tap. 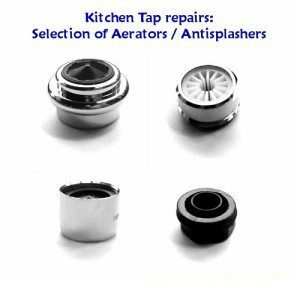 If you have an aerator / antisplasher that needs to be removed with a spanner / wrench be careful not to damage the finish on the part as you want to repair your kitchen tap, not damage it ! (Tip: place some sort of cloth between the spanner and the aerator/antisplasher). If the blockage is caused by limescale build up you should soak the part over night in a lime removal product (Tip: try a home remedy like white vinegar or lemon juice work if you want to be Eco friendly and budget conscious!). 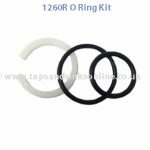 “Sometimes limescale is a bigger problem and then you might need to look at a water softener. There are different types on the market and some types require salt to be added. We would recommend the Aquabion Water Treatment System because it’s an environmentally-friendly, ION active anode, water treatment system that neutralises aggressive waterborne Limescale by using active sacrificial Zinc anodes”. For further information on Aquabion contact us at sales@tapsandsinksonline.co.uk or go to www.aquabion.com.